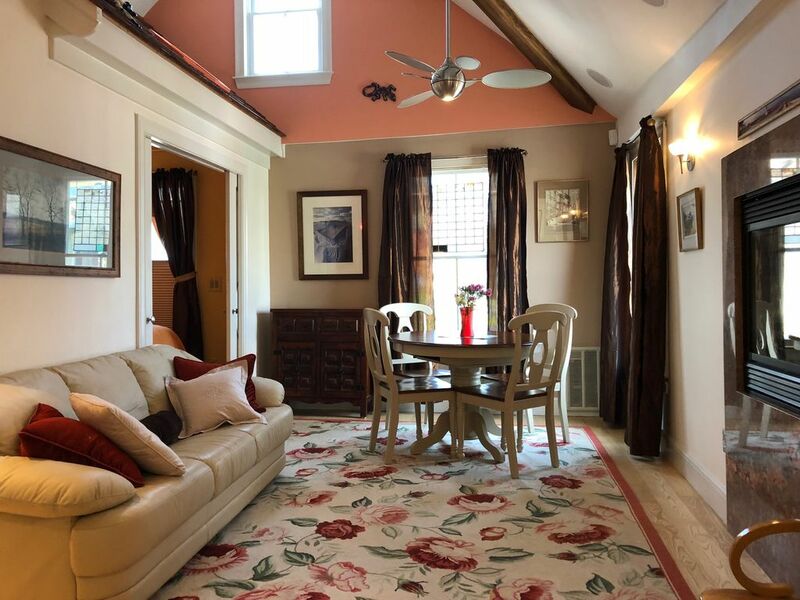 This Luxurious Condo is conveniently located in THE center of town, just steps to the beach, wharf and Town Hall, it is a perfect place for people watching, with windows that peer over Commercial St and a glimpse of the Pilgrim Monument. The interior screams with style and comfort, offering central A/C to cool you & 2 gas fire places for those chilly nights! This apartment style condo features a king bed in the master suite, a queen bed in the 2nd bedroom & 2 twin size beds in the sleeping loft, just right for those perfect moments! The living area sports an HD 52' TV with surround sound entertainment system & Ipod dock. The private, roof top deck has exterior speakers and offers views of the wharf, lighthouse and the harbor. Forget the laundromat, inside this home, away from home, a washer and dryer awaits your clothes. The master suite offers a walk-in closet and private bath, with dual vanities. The kitchen is a chef's delight with granite and all the right, full sized, s.s. appliances. Once your here, your vacation begins! Pet policy: We love pets, though our association does not allow for tenants to have them. Please inquire about special requests/ rates etc! We are reasonable people and aim to satisfy our guests. Mike and Joe are both Realtors licensed in the state of Massachusetts. If you or anyone you know are in the market to purchase or sell Real Estate on Cape Cod we are here to help! Location, style, comfort and privacy. The relaxed atmosphere and comfortable interior along with the private outdoor, rooftop deck offers a city style flat in the center of this unusual seaside town. Location! Walk to the beach, wharf and every restaurant and shop on the main street. People watch from the dining area window that towers over Commercial Street. Step out of the busy hustle into your home away from home and relax in the comfort of your private top floor flat. The private bath in master suite has floor to ceiling tumbled slate tile, two vanities, skylight and tiled shower with two shower heads. The 2nd bathroom has floor to ceiling custom ceramic tile, full-sized, stacked laundry and very tall, custom tiled shower with glass blocks. Both bathrooms have comfort height sinks and toilets, tiled floors and adjustable, LBL lighting! 9 Star Condo. was designed to make your vacation time here fun and enjoyable. For the chef, this capable kitchen was intended to inspire and entertain! The entertainment system will keep you dancing or give the movie buffs a big screen and sound to enjoy. Listen to your favorite tunes with your Ipod, even while your out on the deck. Retreat to the private master suite or relax in the cozy living area. Start the day at the dining table with your tea or coffee and watch the people stroll Commercial Street. Since this hot spot is directly in THE center of town, one can easily walk in either lengthy direction to keep your artistic senses, appetite and shopping alive. The numerous galleries, super restaurants and specialty shops east and west will inspire your every delight and bring you back to center at 9 Star Condo AKA your home away from home. Great place in the middle of everything...and that means it can be loud. The owners were outstanding to deal with and managed the one minor issue (ran out of propane so not hot water, cooktop) VERY quickly and it didn't impact us at all. Overall, a great space, especially for families. Our Provincetown vacation this year was spectacular! We were concerned that there would be too much noise being on Commercial St with the bar next door etc, yet it was surprisingly quiet. Its is great to have an oasis in the center of this busy coastal, tourist town with so much activity. We walked the wharf and beach every morning. The monument was another ritual treat, 5 minutes away. Mike and Joe were gracious hosts and stayed accessible and made excellent recommendations. The master suite is very comfy, yet the open kitchen and living area was our most pleasurable place to hang. The private deck was fun to relax on in the evening and night. We fell asleep out there! We really liked their personal touches and plan to come back! My husband and I spent a long weekend here at the end of August with our 21 year old daughter and 16 year old son. This is a beautiful condo in the heart of Provincetown. We were welcomed with a bottle of wine and fresh flowers. The condo was clean and well appointed. We loved our stay here. We got coffee and breakfast every morning at the Portuguese Bakery next door and ate it on our sunny roof deck. We brought our bikes on the ferry (no need for a car) and enjoyed cycling on the bike paths along the Cape Cod National Sea Shore. The views from the top of the Pilgrim Tower are worth the climb! We enjoyed great meals at the Canteen and the Mews. P'town was rocking on the Saturday night we were there. Although we could hear the noise from the street it didn't keep us awake. Even my daughter in the front room slept through it. When we discussed it Sunday morning we both said we felt like to should have gotten out of bed and enjoyed the party but fell asleep instead. We would love to come back here! Just like Provincetown this place is fun and adorable! It's the best location to stay and I'd suggest it to anyone who wants to be in P-town. We were so surprised at how unique and how roomy this place is. The location allowed us to stroll the lively down town, water front, wharf and beach. Yet we felt a great sense of privacy while indoors. The kitchen is a pleasure to cook and socialize in. We all enjoyed ourselves here and will return again. It was a real treat! Very comfortable and close to everything! We really enjoyed this place, more than any other! We found everything we needed to create a meal and hang in style. Other nights we had drinks on the deck before hopping around the many social destinations. It is so comfortable and private right in the center of town with no need for a car! The owners offered suggestions and created a fun home to share. We will return again next year! thank you very much! appreciate your feed back, and stay! No need for a car, 9 Star Condo has a walk to everything - in town, THE center of everything - location! Walk right off the ferry to the 9 Star deck and bring your bike for the trails or a day at the beach; bikes are also available to rent locally. Just steps to the Town Hall to watch the many of the local performers and variety of people, or go inside and gather local info. Stroll the streets, east and west, and shop the many fine specialty stores, galleries and restaurants! Hop around to the fun night clubs and make sure to schedule in advance some live shows and entertainment. This colorful town has something for everyone!! With the spring and summer excitement, crisp fall leisure and romantic winter nights, Provincetown is always a beautiful place to be! We are happy to help with any special requests. Thank you for making 9 Star Condo your vacation destination.